Christians throughout history have demonstrated to the world the surpassing worth of Jesus through baptism as an outward expression of the inward reality that Jesus is the Lord of their lives. Water is the physical symbol that God has cleansed believers from their sins through the blood of Jesus. Christians are immersed in water, signifying the death of the old self along with his sin, and believers are raised out of the water to new life in Christ, celebrating a union with the finished work of Jesus and the salvation he has won for his followers. Baptism is a sign from God that signifies inward refining and forgiveness of sins (Acts 22:16; 1 Cor. 6:11; Eph. 5:25-27), the Spirit brings new life (Titus 3:5), and the permanent presence of the Holy Spirit as God’s seal testifying and promising that one will be kept safe in Christ forever (1 Cor. 12:13; Eph. 1:13-14). Baptism carries these meanings because it primarily signifies union with Christ in his death, burial, and resurrection (Rom. 6:3-7; Col. 2:11-12); and this union with Christ is the source and foundation of every component in our salvation (1 John 5:11-12). Looking at the New Testament practice and teaching, we see that baptism is for believers and is to be performed when someone repents of their sins and trusts in Christ. Is baptism associated with conversion? The Apostle Peter preached to the crowd explaining to them that they have witnessed the long awaited promise of the Spirit. Peter goes on to tell them that Jesus’ death, resurrection and exaltation demonstrate that He is both Lord and Christ (Acts 2:22-36). 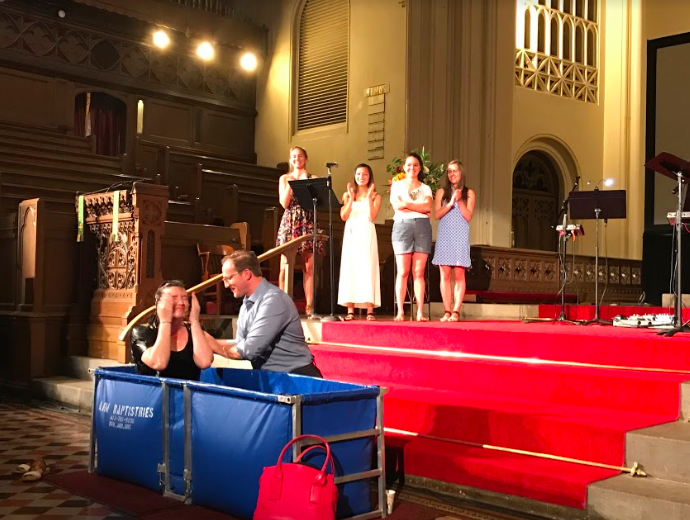 Convicted, the crowd asks Peter what they should do to be saved, and Peter responds: “Repent and be baptized every one of you in the name of Jesus Christ for the forgiveness of your sins, and you will receive the gift of the Holy Spirit” (Acts 2:38). We see from the example at Pentecost that baptism is associated with becoming a Christian—with one’s conversion to Christianity. It serves as an initiation rite into the church. As was the case with the converts at Pentecost, baptism was accompanied by repentance and receiving the gift of the Holy Spirit. Normally in the book of Acts, all three of these conversion components—baptism, repentance, and receiving the Spirit—accompanied each other and usually happened on the same day. Why should believers get baptized? Baptism is an important part of Christian practice and theology. It was the Lord Himself who instructed His followers to “make disciples of all nations, baptizing them in the name of the Father and of the Son and of the Holy Spirit” (Matthew 28:18). Ever since the Lord gave these instructions, the church has been baptizing believers, as was the practice when the Holy Spirit was given to the disciples at Pentecost (Acts 2:1-13). Baptism was so commonly practiced in the early church that the Apostle Paul, when writing to believers, simply assumed that everyone had been baptized. He does so when he says to the believers at Galatia, “For as many of you as were baptized into Christ have put on Christ” (Galatians 3:27). In New Testament times, virtually all believers were baptized. Baptism is one the most important elements to declaring your faith to the world. Jesus declared, “Go therefore and make disciples of all nations, baptizing them in the name of the Father and of the Son and of the Holy Spirit.” (Matthew 28:19) It’s an outward sign of an inward reality. Those who were sprinkled as infants may well view their sprinkling as a legitimate baptism and have no desire to be “re-baptized.” However, since baptism is reserved for believers and serves to publicly mark their commitment to Christ and his church, no true baptism can take place without genuine faith. Thus, a sprinkling as an infant is not actually a baptism. The one who was sprinkled as an infant needs to obey Christ in all things and submit to baptism as a believer. Should believers who were baptized as infants or children get “re-baptized”? It may seem strange for someone who has been a believer for many years to do something as basic as getting baptized. She may even feel as if it undermines the legitimacy of her faith. Believers who have faithfully followed Christ over the years and have even been active in ministry, but who have never been baptized, might for these reasons be reluctant to get baptized. Such a believer must recognize that getting baptized does nothing to question the genuineness of her faith. The baptism is certainly not a rededication to Christ since at no point did she cease from following Him. Rather it is an act of obedience that comes from the recognition of the importance and significance of the Christian practice. What does baptism have to do with church membership? Requiring baptism for membership is one way the church honors the words of the Lord when he instructed his followers to make disciples and to baptize them. So it’s reasonable for the church to require of those desiring to join that they be committed to following Christ and walking in obedience to Him. The call to get baptized is a simple act of obedience and shows commitment to following Christ in all things.